I say this several times a week. Usually when I'm tired and my children are particularly disobedient. I try to be kind and understanding. To breathe deeply and close my eyes. I pray and do my best to keep my voice free from anger. But eventually the whining and crying and repeated throwing of toys (or jumping on the couch or playing in the toilet) just gets to me, and I find myself losing my patience. Most recently it was during nap time. I was tired and desperately wanted a nap of my own, but my two-year-old would hear none of it. He refused to stay in bed unless I sat right next time him, and even then he squirmed and played. I repeatedly told him to be still and be quiet knowing his extra energy was just his way of fighting sleep, but still he refused to take a nap. Honestly, the entire morning had been this way. Everyone was just a little too fussy (including me), and I was so looking forward to the few hours of quiet. But after 45 minutes of battling my toddler, I felt my last hope of quiet rest slipping through my fingers. I was losing my patience. I wanted to reach out and spank him. He probably needed it, but I knew hitting him out of anger would just make our situation worse. Instead, I sat there next to him and cried. I fought the frustration and anger that welled up in my heart, but the voice of doubt crept in anyway. "You are a terrible mother." "You're going to be tired forever." "It's only going to get worse!" I was moments away from losing all semblance control, just because of my toddler refused to take a nap. I buried my face into a pillow and cried out to God. 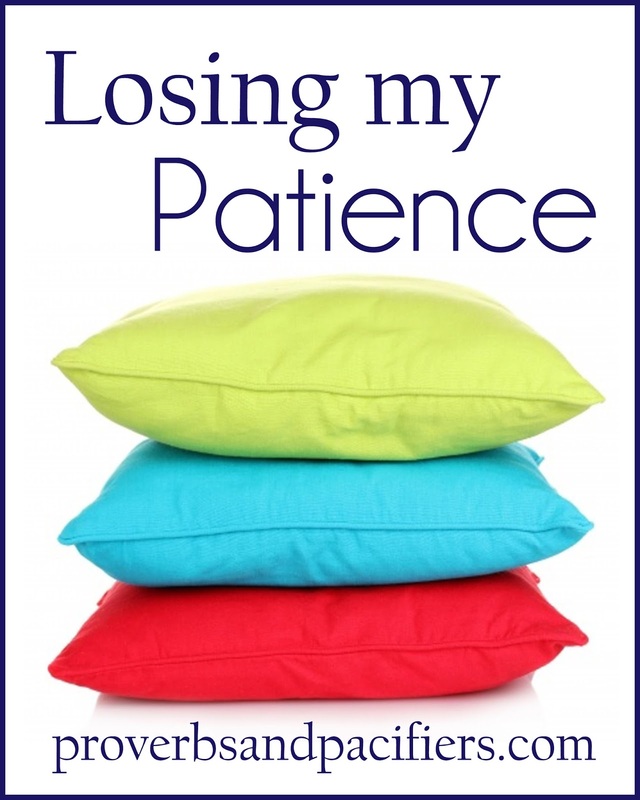 "I'm losing my patience! I can't do this anymore!" And the Lord said, "My child, I AM patience." There are times in our lives when we simply run out of steam. We run out of kindness. We run out of love. We run out of patience. Our human supply of these things is often limited to our good humor and our good circumstances. When serving the Lord gets tough, we will often come up short. But God is never lacking. He is always kind. Always loving. And always patient. That moment sitting on the bed next to my son, I realized that if God has an endless supply of patience then I can be patient even in the most trying of circumstances. His Spirit is in me, and when I can't muster patience of my own, I only have to turn and borrow His. "Lord, I am patient because you are patient." I repeated this truth to myself as I continued to lay my son down for his nap knowing he needed sleep. I found myself thanking God that even when my children are disobedient, I can choose to do the right thing. I can't control their behavior, but with the help of God's Spirit I can control mine, choosing to respond with love and grace and patience. I'm no super mother. I'm definitely not a super Christian. I often find myself tired, frustrated, and weary of the constant training my children need. But I serve a God who is patient, and when I am weak I simply have to let down my pride and ask his Spirit flow through me. I am patient because God is patient. We'll this post couldn't have been any more timely. Thank you, Katherine, for this encouragement. I hear ya and you're not alone.